I don't know what I'd do without the coaching, inspiration, and opinions of other Ravelry knitters. How did knitters ever figure stuff out back in the day?! I've been working on the School Girl Socks pattern by cabinfour, gifted to me by Rav friend Sharon. She's been coaching me along with modifications since we both are using dk weight rather than sport weight. My brain can't quite grasp the math, so it has been a leap of faith here. I'm generally a pretty cautious person, and with knitting I don't trust myself to not follow the pattern exactly as written, use the yarn called for by the designer, etc. Now what is the worst that could happen? Sharon says I need to just dive in and go for it, throw caution to the wind! This is only the second sock pattern I have made. The first pair was made years ago, before Ravelry, and I didn't have a clue what I was doing, although they turned out pretty well. The hard part was understanding sock construction. I found this diagram online somewhere that helped me a lot. 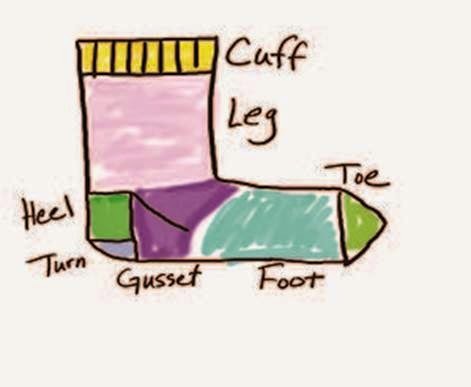 Okay, so NOW I know where a gusset is located! Now on to sock #2! Do you like? Great job! I love the color of the yarn you are using. I remember well the confusion of knitting the first few pair of socks. It took me a while to catch on to the heel turn.